Last year, Donald Glover starred in a Saturday Night Live parody of a music video for R&B singer Oran “Juice” Jones’ 1986 song “The Rain.” On last night’s episode, the cast debuted a remake of another obscure ’80s video. 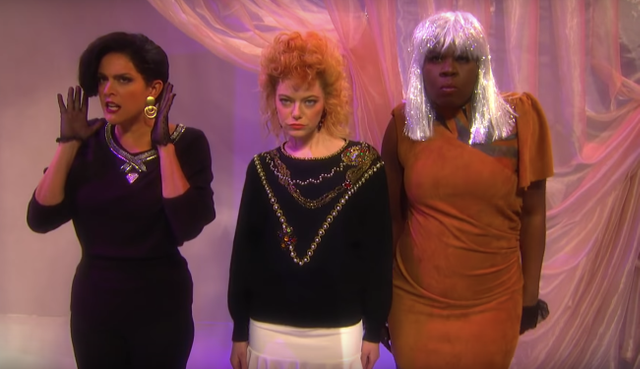 This week’s host Emma Stone starred in a rendition of the music video for Klymaxx’s “Meeting In The Ladies Room” alongside Leslie Jones, Cecily Strong, Kenan Thompson, and Beck Bennett. In the parody, Stone, Jones, and Strong go to the ladies room and sing about a man who has done them wrong. But as it turns out, the ladies room is a fitting room at Limited Express. The parody perfectly mimics details like the bizarre intro monologue, the silver wig, and the man hooked up to an electric chair. Strong co-wrote the sketch. Watch it below.